Gloria Bauerle lives on the sunny side of the street and takes a spoon full of sugar to help the medicine go down. It works. She radiates. She emanates joy. 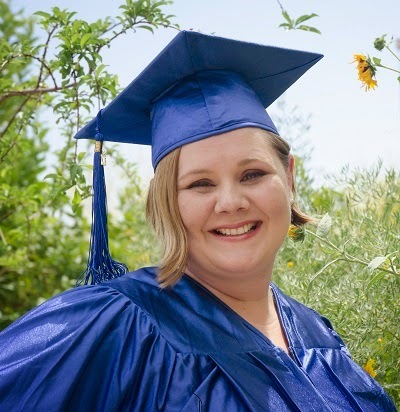 Attendees of Rio Salado College’s 2014 High School Equivalency Graduation are bound to get a dose of Bauerle’s energy when she takes center stage as Student Speaker. Rio’s HSE graduation committee chose Bauerle because of her academic and civic achievements and her ability to inspire. Knowing her life story and the challenges she has overcome makes her all the more captivating. Bauerle was born in 1979 into a family of ten in Salem, Oregon. Her parents were part of a religious cult, which compelled them to do some erratic things-- like move the family nearly 30 times throughout her childhood. She describes the experience as unstable and traumatic. Her troubles didn’t end with childhood and became debilitating over time. Bauerle finally found the help and stability she needed. Along the way, she fell in love and created a family that embodied what she always thought a family should be. She became a stay-at-home mom and began volunteering as a community organizer and mentor. Through the years she has mentored women affected by sexual abuse and domestic violence, hosted self-help workshops and started a food bank that continues to serve people in need. Life was good; she was living the dream-- until last summer. Without a high school diploma, Bauerle figured the prospects of employment were slim but was pleasantly surprised to find a job as a career coach. She also found a new sense of confidence. “I discovered quickly that I am just as smart as anyone,” said Bauerle. She also came to realize it was time to pursue higher learning and enrolled in Rio’s HSE Preparation program. With that in mind, Bauerle is taking the next step as a college student to pursue a degree in communications. She has been accepted into Rio’s Adults Achieving a College Education pathway-- a scholarship-based college and career preparation program. Bauerle is one of 594 students who have already completed Rio’s HSE prep program and passed their GED® tests during the 2013-14 academic year. She will be joined by more than 200 other graduates and their guests during the HSE Graduation on May 13 at Comerica Theatre in Phoenix. This story can also be found in the May 3 edition of the Tempe Republic.